Deborah Swinglehurst, Celia Roberts & Trisha Greenhalgh (2011). Opening up the “black box” of the electronic patient record: A linguistic ethnographic study in general practice. Communication and Medicine 8 (1), 3-15. 2) screen capture of the computer screen, displaying the electronic patient record. A discretely placed camcorder was used to record the interpersonal interaction. The screen capture was done using inexpensive commercially available screen capture software, which ran from a USB memory stick. I merged these two parallel video streams together using video editing software (Adobe® Premier Elements 4). I transcribed my video data by hand, using standard orthography throughout. I used standard Jefferson conventions for transcription of the spoken word, as used in conversation analysis.2 To this I added a brief written description of bodily conduct, with the inclusion of a simple horizontal arrow (→ or ↔) to indicate direction of gaze between clinician / patient /computer screen. I adapted an approach to multimodal transcription described by Carey Jewitt, in which different modes are presented in adjacent columns of a table, with time as an anchor.3 This resulted in a 5-column table, with columns for 1) time 2) speaker 3) spoken word / sounds 4) bodily conduct, including notes on gaze 5) brief notes on the computer screen display. Transcribing bodily conduct is difficult and there is no agreed system or widely agreed convention as there is with the spoken word. One challenge of transcribing bodily conduct is that it does not observe the same boundaries as the spoken word. My decisions around when to start a new row of the transcript table were sometimes related to turns in speech and sometimes related to shifts in bodily conduct or screen changes. This was a matter of judgement. There is always scope for privileging one mode over another and this is something the researcher needs to be reflexively aware of if a truly multimodal approach is sought. In transcribing one must always balance the tension between accuracy, readability and political issues of representation4 – and to some extent any transcript is always a compromise. My rationale was informed by a wish to produce transcripts which are detailed but accessible to the reader (including the non-expert). I also wanted to retain a sense of ‘fluidity’ and complexity in the multimodal interaction. I had to work within ethical constraints which meant that I could not include images (see below under “other issues”). 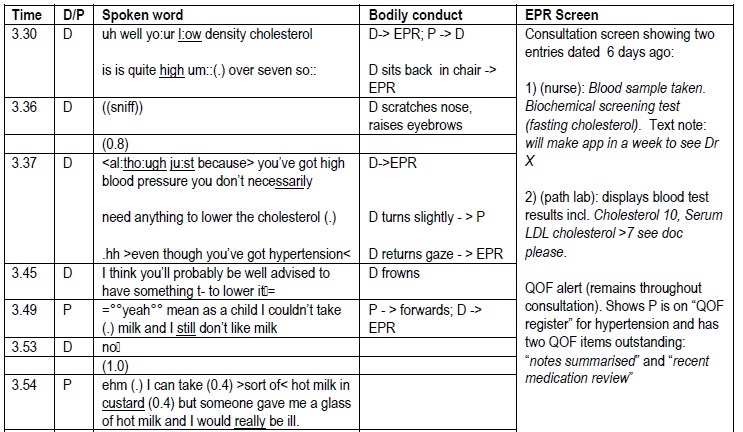 Other researchers have developed notation for illustrating gaze5 or bodily conduct in the context of consultations involving computers6 but I found that the level of detail involved resulted in a rather cluttered transcript and I found that the notation was less easy to follow than a few carefully chosen words. I accept that the result is less comprehensive than it might be, but hope that its readability more than makes up for this. I am also aware that by positioning the column for spoken word to the left of the column for bodily conduct that this tends to privilege speech to some extent. It was extremely time consuming – one minute of video footage took several hours to transcribe. I do not have ethical approval to show video (or still screenshots of video footage) in publications or at conferences. My transcripts have to ‘stand alone’ as adequate, sufficient data for readers to make sense of alongside my own analysis. This comes with a burden of responsibility to ensure meticulous care in producing the transcript. Transcription was not a one-off activity, done after data collection and before analysis, but very much part of the ongoing analysis. I revisited and refined my transcriptions on several occasions as my analysis progressed and my awareness of salient analytic issues developed. (1) Swinglehurst D, Roberts C, Greenhalgh T. Opening up the “black box” of the electronic patient record: A linguistic ethnographic study in general practice. Communication and Medicine 2011; 8(1):3-15. (2) Atkinson JM, Heritage J. Transcript notation. In: Atkinson JM, Heritage J, editors. Structures of Social Action: Studies in Conversation Analysis. Cambridge: Cambridge University Press; 1984. ix-xvi. (3) Jewitt C. Towards a multimodal analysis. Technology, literacy and learning: a multimodal approach. Abingdon: Routledge; 2006. 32-52. (4) Roberts C. The Politics of Transcription. TESOL Quarterly 1997; 31(1):167-172. (5) Rhodes P, Langdon M, Rowley E, Wright J, Small N. What Does the Use of a Computerized Checklist Mean for Patient-Centred Care? The Example of a Routine Diabetes Review. Qualitative Health Research 2006; 16(3):353-376. (6) Gibson M, Jenkings KN, Wilson R, Purves I. Multi-tasking in practice: Coordinated activities in the computer supported doctor-patient consultation. International Journal of Medical Informatics 2005; 74:425-436.